Sometimes you wake up and think well, this is either a very good idea or a very bad idea. And that's how you know it's going to be an epic day. Especially when that party starts at midnight. 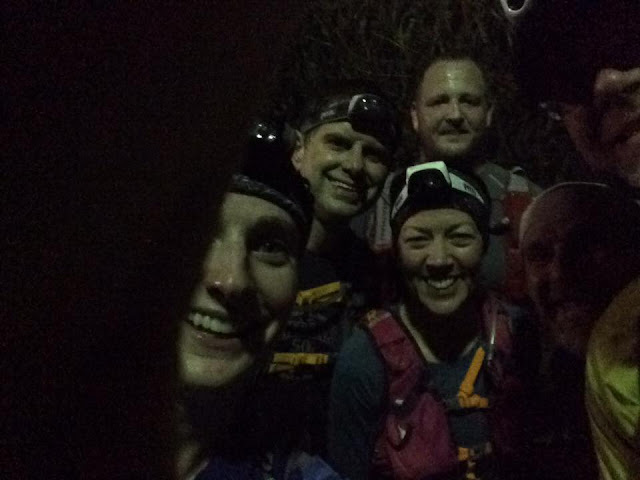 At 00:00 on Saturday, Alison, Bob, Todd, Mark and Dave came over and we ran 14.5 miles, through Corbett's Glen, Ellison, Tryon and Lucien Morin Parks. The temperature was in the 50s and I was a little warm in my long sleeve shirt, until it started raining, and then I was the perfect temperature. I had taken a nap after work Friday night, but I was too restless from excitement and nervousness to get much quality sleep. Yet my legs felt good and I was surprisingly awake throughout the whole 3 hours of our run. (Awake but evidently not very observant. On Saturday night, we were talking about the run and Bob mentioned a campfire that we'd run past and I totally have no memory of seeing that). There is a certain kind of magic in the woods at night. There was a red tinge to the sky, the trails were quiet save for our trail stories and laughter, and we were literally playing leapfrog (apparently all the frogs hang out in Ellison at night!). We ran by McGreggor's just before 2:00 and Alison and I stopped in for last call to use the bathroom. We got back to my house around 3:30 and ate oatmeal/quinoa and bagels for breakfast. It was a crazy excellent adventure, totally worth the missed sleep. I am so lucky to have awesome friends who are willing to come play in the woods at all hours of the night. Thanks to Chris O'Brien for the group shot! We started running from the big chair/dam parking lot on the Mt. Morris side of the park, following the route for next year's Many on the Genny race, for which I am super excited. I don't know if I can run 40 miles, but if I can, I want to do it here! I still felt decently awake and nothing hurt, even as the miles (And the hills. So many hills!) piled on. 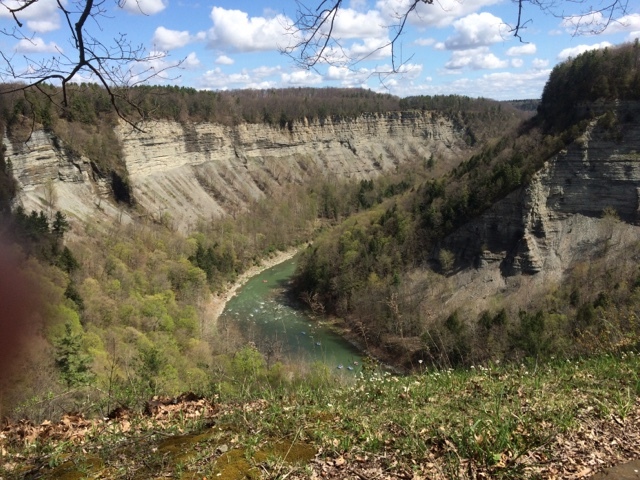 I cannot even describe how awesome the trails and views are at Letchworth. And it's not an exaggeration to say that running in this park the past few years, and the relationships forged while doing so, have been totally life changing. When we got to mile 12 at St Helena, I was surprised by how good I still felt, especially once I refilled my water. My right calf had charlie horsed while climbing over a fallen tree, but it seemed fine once I drank more water and took a salt tab. It was a beautiful day, sunny and warm. From this point, we only had about 5-6 miles until the rafting parking lot where the group had left some cars, and considering I was already balls deep into this thing, I figured I might as well go all the way. Around mile 3 we had all been talking about how far we planned to run, I was thinking only 10 miles and Eric said "The Jen I know goes all the way." My adventure brain really wanted to. So I decided that if my body was up to it, go all the way I would. 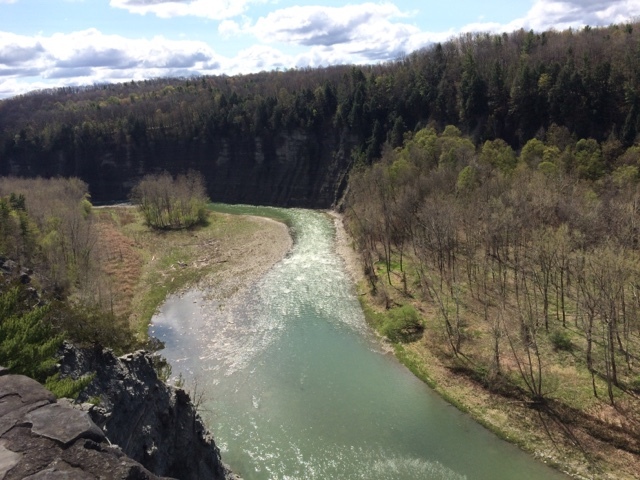 Besides, the second half of this run is my favorite part of the whole course, with all the waterfalls and stone stairs and breathtaking gorge views. After St Helena, the group had gotten spaced out and somehow I ended up running by myself. My body felt remarkably good and I was totally in the zone, happily cruising along, walking the hills but running everything else By this point, the trail is pretty straightforward, you just follow Trail 1 along the river. I've done it before, but I was starting to fatigue mentally and somehow I went the wrong way. I knew the trail I was on wasn't the right one, but it was awesome singletrack and I was still headed in the general direction of the cars, so I just went with it. My phone beeped and I saw that I had a voicemail from Pete (cell reception is spotty in the park so the phone had gone straight to voicemail). I listened to his message as I walked a hill. It was around 11:30 and he said he was going to try to Skype me at 12:00 so I wanted to finish running by then. I was talking to myself, or maybe out loud (the lack of sleep was catching up to me), trying to figure out a game plan for how to get back to the parking lot. For some reason, I randomly shouted "Hello?" at one point, but didn't hear anything in response. I kept following the trail and then suddenly Chris and Ron appeared coming up the side of a hill. What a sight for sore eyes/brain. 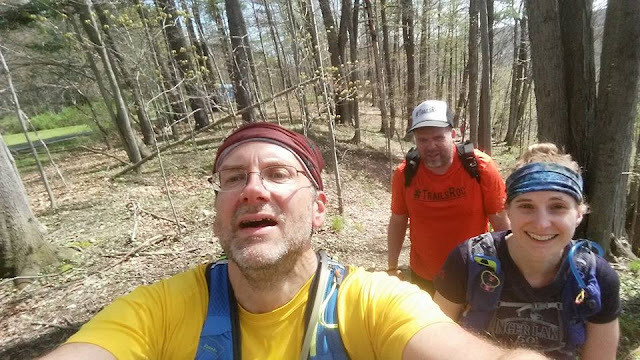 We followed the trail, hopped over a fence, ran through the campsite and ended up back in the parking lot, where we hung out waiting for the others to join us. 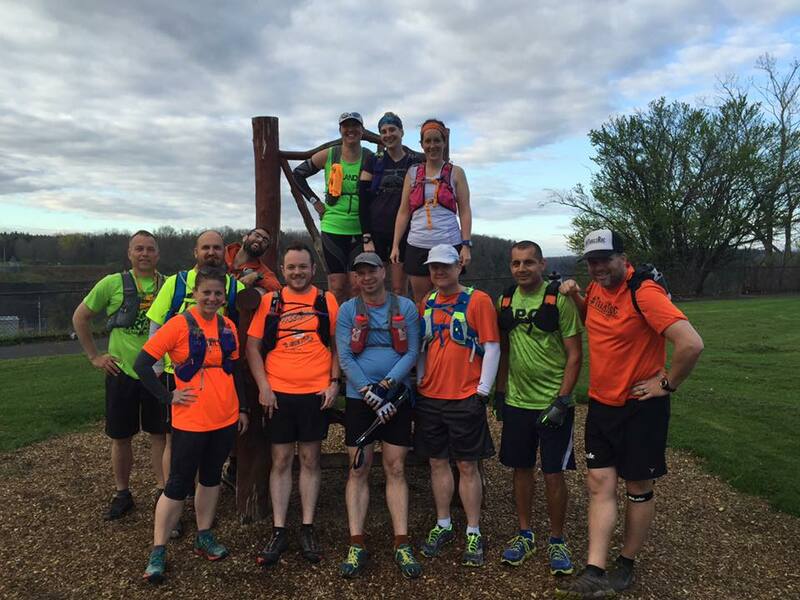 In total, we ended up with 18-19ish miles, making my total for the day at least 32. Pete called me and I got to talk to him briefly before the phone cut off from lack of signal. Infinity of thanks to Sheila and Eric for planning the best adventures! And infinity of thanks to Chris for giving me coconut water, letting me use his chair, and giving Prem and I a ride back to our cars at the starting point. Which was conveniently located next to the visitors center/gift shop, where Prem, Chris, Sheriff Ron and I got ice cream. Let me tell you, that waffle cone with 2 scoops of Panda Paws really hit the spot. It was the perfect end to a morning of adventure. I drove home, showered, took a nap, then went to Extreme Book Club at Bob's house to eat delicious make-your-own pizzas and cookies. Back at home, I fell into bed again, tired and happy. This is my life, a series of epic adventures and amazing people. I love it. Lyric of the moment: "When my heart is ready to burst. When the world is spinning in reverse. I'll keep running. To the place where I belong...When the lights are faded to black. Only stars are guiding me back. I'll keep running. To the place where I belong..." ~James Bray "Running"